6 MONTHS PASSED THIS WAY. THE LIFE IN THE PALACE WAS USUAL. 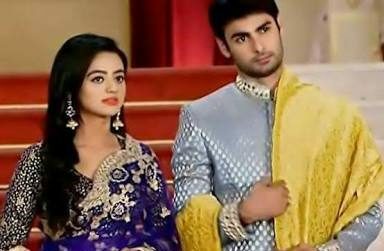 LOVE WAS INCREASING AMIDST SWASAN DAY BY DAY. She came to raglak’s room. Guard: yes… its as usual? Swara nodded. She moved from there. A pair of eyes were following her. She came in front of ap’s room. Guard: maharani is sleeping inside. Maharaj is on terrace. He said you only called him. Guard was astonished. Swara ran towards the terrace. She looked here and there. Dp was not there. Suddenly her leg fall over something. She fell down. She turned to find dp lying in a pool of blood. Before she could say anything or you can say before she can understand completely the matter something hard struk on her hand. She clutched the thing. It was a knife. Her mouth opened to scream. But a hand closed her lips and made her smell something. Before even her heartbeat could raise her eyes shut themselves. She lost her balance. She fell down clutching her head. She felt dizzy. She felt her eyes closing. She was about to collapse when the sound of taking out swords woke her up. She opened her eyes just to find herself surrounded by soldiers. She looked at the scenario. Even a beginner could say that she was the one who attacked dp. She opened her eyes completely. She came back to senses. Soldier: you have attacked the king. Suddenly a scream curdled her blood. MAHARAAJJJJJJJ…. she looked at the direction. It was ap. She ran towards dp. She looked at swara disgustingly. Then again at dp. Ap: maharaj…. you can’t leave me. You just can’t…. She was about to collapse when swara tried to hold her. She threw her hand away. She slapped her. She again slapped her hard. Swara was shell shocked. She was unable to understand what’s going on. Before she could complete her sentence she heard footsteps. She turned her face only to find two eyes whom she knew she had trust. Sanskar looked at the dead body of dp. He saw him lying in a pool of blood. He suddenly lost his balance. His eyes closed taking him into unconsciousness.